Recently I've been spending some time with younger children and teens in a low-income area of my community, and there is a question that's been plaguing me. How do you help students catch up when they've received a poor K-12 education? When you're young you don't control where you're born or what school you attend. What happens if you happen to go through life in a school that simply doesn't prepare you for what you hope to accomplish in your future? Or what if other stressful things occur in your life that make it impossible to focus, study, or develop the habits necessary to learn what you need to learn when you're young? What happens when you get to community college and test into remedial courses. Is there hope? That's one of the many questions that's been plaguing me lately, and it's one of the reasons I'll be attending Harvard's Institute on Closing the Achievement Gap next week. "'Freshman year is this unique moment in time. Kids who have not had to persevere as much walk into college and they coast, for the most part. Or they're partying too hard. And in that moment, if our kids are working diligently and building relationships with professors and studying and using all of the skills that we've trained them to use, they can close the gap.'" (as cited in Tough, 2013, p. 172). What really intrigued me about this is the idea that even if you don't grow up with a lot of money or in an area with a stellar public school system, maybe, just maybe, you can still compete - you can still catch up. You can still succeed. Regardless of whether your school failed you or you failed yourself, that doesn't matter as much as what you're going to do about it now. I've always believed that there's still hope. If Nelson is right, your freshman year can be an opportunity for you to get ahead and compete on the same level as your more affluent peers. But here's the thing - you can't coast. It may seem unfair. And you know, it is. But complaining about the inequality at this point won't do you any good. Focus now on catching up, fighting for the education you want, and then as you build your career maybe you can help fix some of these inequalities that make you have to work so much harder. The cool thing, though, is that having to work harder and overcome adversity is said to develop some pretty great character traits that can help you succeed in life. Adversity, as Darren Hardy has said, can be an advantage. So with that in mind, realize that community college can be your opportunity to catch up, to get better, to get smarter, to compete, and to get the education you need to get where you want to go - wherever that may be. You still have a chance at the ivy leagues if that's what you want. Or you can be the absolute best paramedic, police officer, dental hygienist, nurse, or any other of the amazing career programs CC's offer. You must build a community who can support and advise you. And you'll have to work harder than everyone else around you. You'll have to focus. You'll have to invest hours and hours outside the classroom. You'll have to spend tons of time in the tutoring center. You'll have to rewrite and rewrite your essays. You'll have to study like you've never studied before. You can not only catch up, but you can even get ahead. You have life experience and insight that no one else has. And if you can couple that with a solid education and develop grit in the process - well then watch out world, because you're going to do big things. This isn't easy. If it was, we wouldn't have so many college dropouts. And while I care about the statistics and want things to be better for everyone, my main focus has always been you - the student in community college right now. I'm concerned with making sure you have what you need to beat the odds and get where you want to go. And it starts your freshman year. 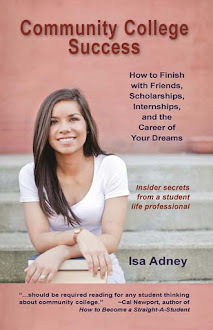 To get started right now, read at least three books this summer on college success to learn strategies that can help you prepare to rock your freshman year and develop a lasting edge. Tough, P. (2013). How children succeed: grit, curiosity, and the hidden power of character. New York: Mariner Books.